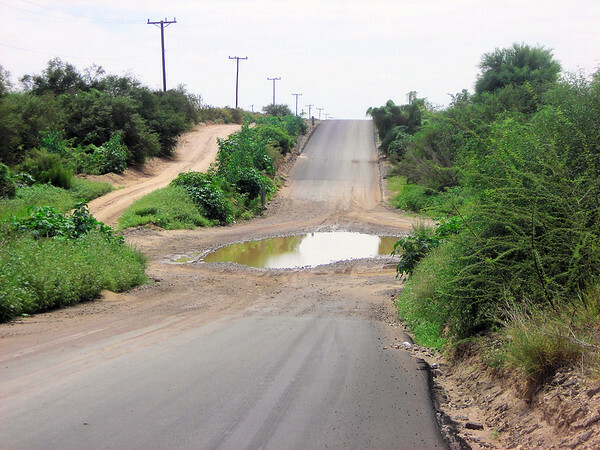 Riding out of Loreto at 10:00AM is challenging, flooded roads, huge pot holes, slippery mud and tight morning traffic. Every large flooded section I fear hitting a big hole. There is still plenty of time to make Scorpion Bay sometime today. 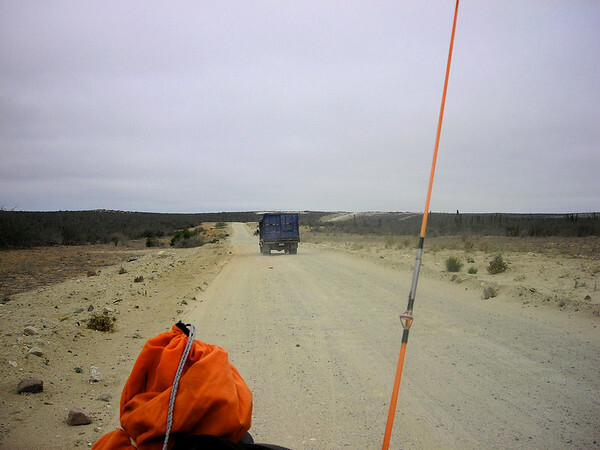 The southern route is the longest route to Scorpion Bay but also the easiest with only 30 miles of dirt. 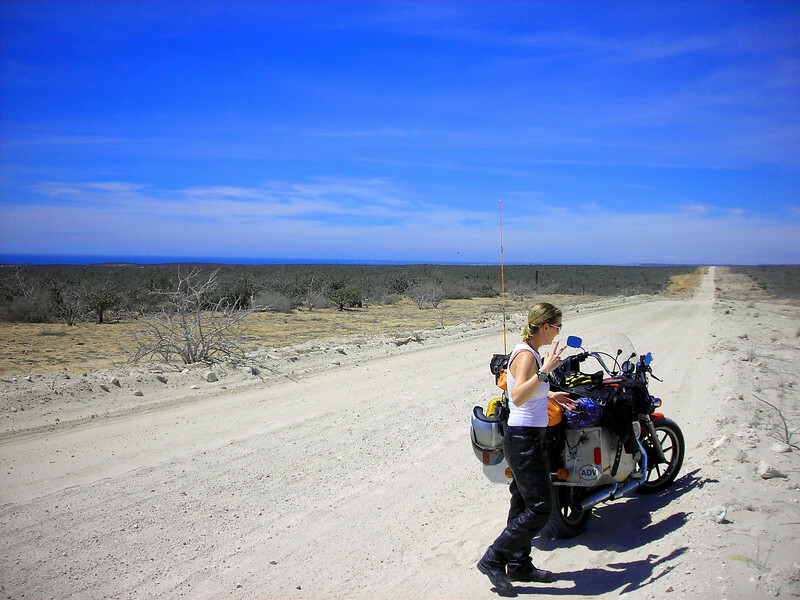 Still, 30 miles of Baja dirt road can be a killer, especially 2-up on a Harley Davidson Sportster loaded down with gear. 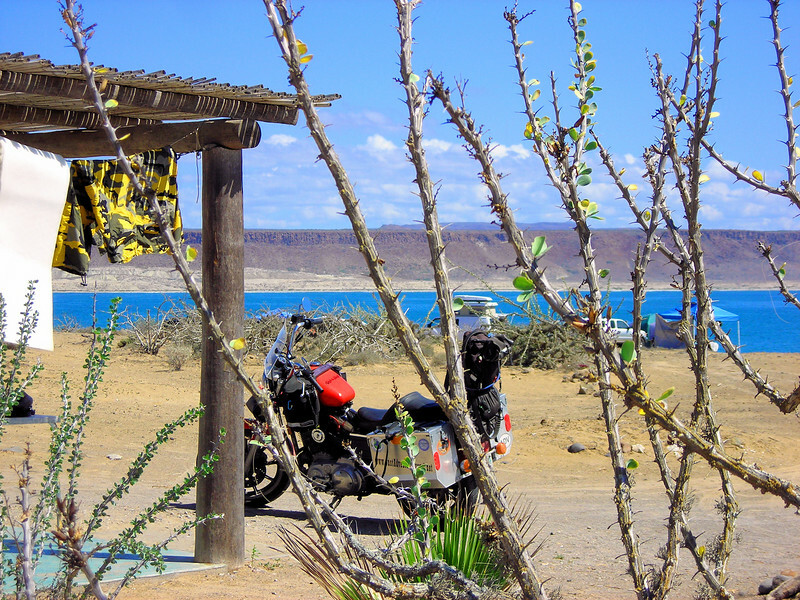 South of Loreto there are several sections of road flooded out with an option of taking a dirt path on the side, the water is less deep there. Here the dual-sport knobby tires would be choice but in Arizona the decision was to just go with street tires the entire ride because of the longer wear of street tread. The plan was to buy a knobby near the Mexican border, haul it amd put it on when needed but decided against it because of added weight and space. Gas at Ciudad Insurgentes and stop for a cappuccino, perfect and one of the best cappuccinos ever, what a surprise, an extra large far a couple bucks. this would be five bucks in the US and probably not as good. It's 100 miles to Scorpion Bay from the gas stop, another gas stop will be 5 miles past the turnoff to Scorpion Bay. The road is straight and in good shape at first followed by sections riddled with large deep pot holes. Keeping it under 50 MPH throwing the bike left, right, left, right, left, right I finally get a double-double poke from Heidi. Yes, all is good so far only hitting a few small holes but if the front tire hits a big hole straight on it will be bad, and not worth it. This is our life, it's not a vacation so we are in no hurry, it hasn't even been two months yet sense we left home, there is a long way to go. 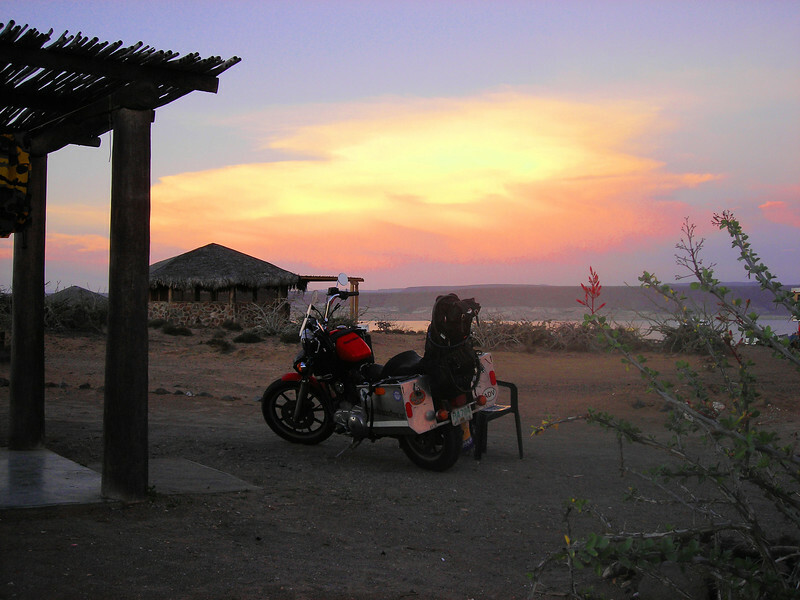 After the turnoff to Scorpion Bay there was no gas in sight, after talking with the local police we turned it around. The thought is that 8 liters less fuel will help the ride and bumps, we just have to ride slow and get high mileage. 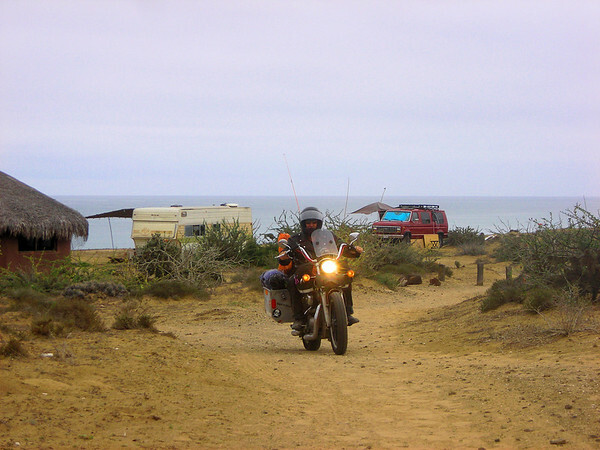 There are killer washboards, big rocks and sections of deep sand requiring standing on the pegs and goosing the throttle to manhandle the bike. I'm glad I grew up riding dirt bikes in the back country of Northern Wisconsin, without that experience we would have turned around for sure. What a pro Heidi is, but she did admit once at a rest that the deep sand and sliding back and forth on the road has kind of "freaked her out" she asked God to help us at one point. I assured her I will slow it down much more after almost loosing it a couple more times. I know by riding a little faster will make a spill in deep sand less likely but at this point a spill in deep sand at real slow speeds is an acceptable better choice (my inner voice says "I will Not Spill!"). After an hour of hard riding we make it 15 miles, Sweet! The conversations is all about 'Half way' "We will make it" The ritual every time we mount the bike is 'Safety" and no matter what happens, if we stay safe and healthy we are going to have a good time. A few more pics from Scorpion Bay. 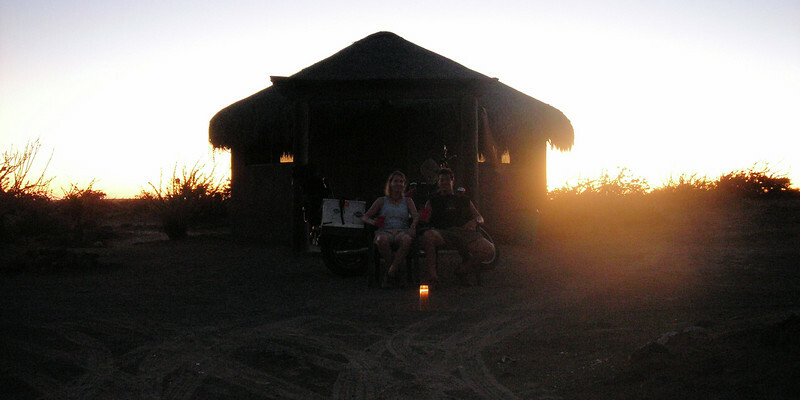 The plan is to pitch our tent but a palapa is open for rent, we take it. 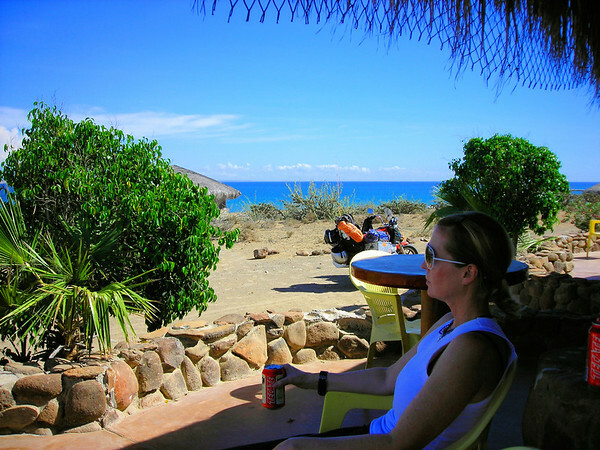 The palapas are much cooler inside during the day and have a great view of the bay, OK---can do. The palapas are comfortable, sleep 6 or more people but are a little expensive. Bringing candles and bug spray greatly added to the comfort level. This guy practically flew right at Heidi's feet while we are eating some canned corn and tortillas. It didn't want any food but sure seemed like it wanted something. Maybe it knew we liked birds. The surfing in the bay is poor today but people are enjoying the water anyway. 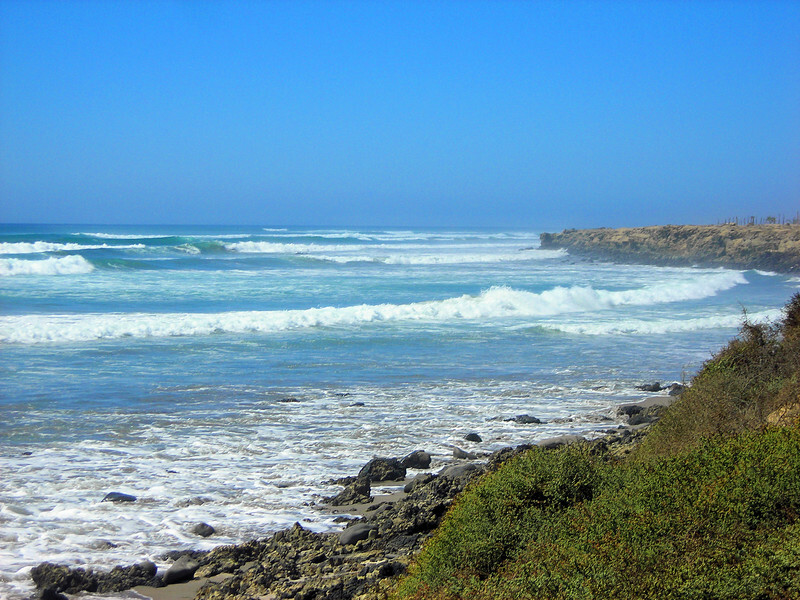 A long walk along the coast. This stretch of coast is all under development for practically as far as you can see. The word is that a few years ago plots were selling for $50K US. Now the same plots are selling for $80K to over $100K. There is no AC power out here or anywhere in Scorpion Bay. All the power comes from diesel generators, solar cells, wind generators or some combination. All the water is trucked in. I'm sure this is why the prices for lodging and camping are expensive here. 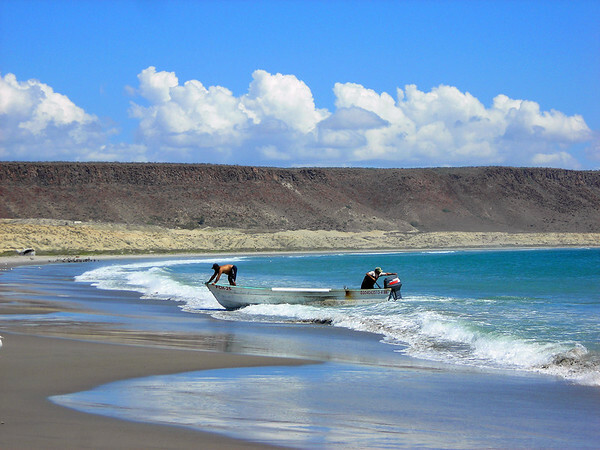 .Scorpion Bay and the village of San Juanico originated as and still is a fishing village. Fishing boats head out while it is still dark and start returning between Noon and 2:00PM, it fun to watch it all happen from out doorway. Standing on the cliffs overlooking the bay is what looks like coral reefs but they are actually huge schools of fish. Sometimes the fishing boats will stop on their way out and fish at one of the schools. 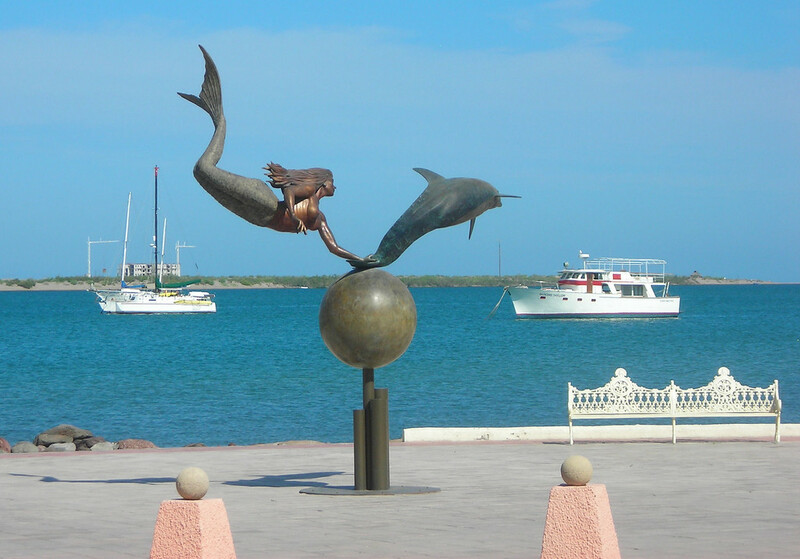 One morning Heidi and I saw over a dozen Dolphins surfacing around one of the fish schools. It is fun watching four or more Dolphins all surface in unison over and over and over. Wow! It's been great here but time to go. 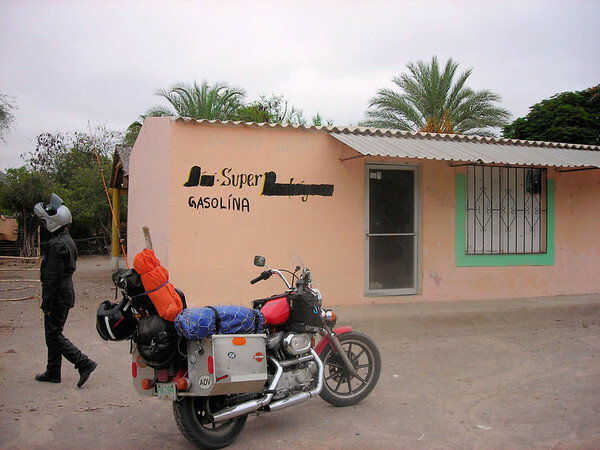 The plan is to meet a couple we know from the internet motorcycle adventure website advRider.com, they are riding a motorcycle to South America and are riding through Mazatlan, same as us. 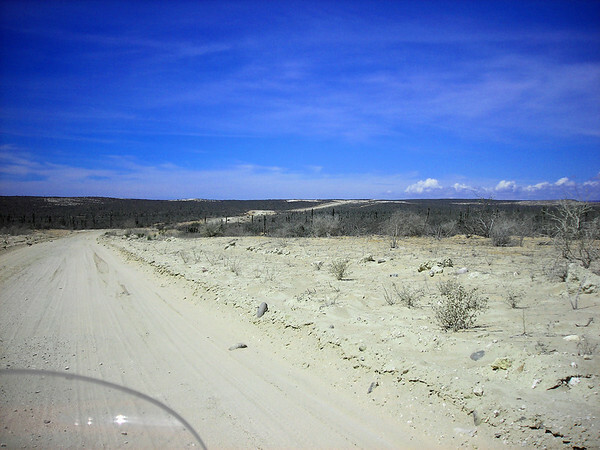 The 20 miles of dirt road south of town didn't get any easier to ride. I kept the speed way down which helps on the washboards but makes the deep sand more difficult. Sometimes in deep sand we fishtaile from one side of the road to the other before bringing it under control. The greater speed causes increased inertia on the wheels which make the wheels track better in deep sand. This was not fun with my precious cargo on back so I keep it slow anyway. If we are going to 'dump it' it will be a slow dump. During one rest stop this truck with locals stopped to make sure we don't need any help. That makes us feel great knowing that even out here in the middle of nowhere we can get help if we need it. The scenery doesn't get any less beautiful on the way back. If we try to maker it back to Ciudad Insurgentes means we will be pushing our gas range limit. 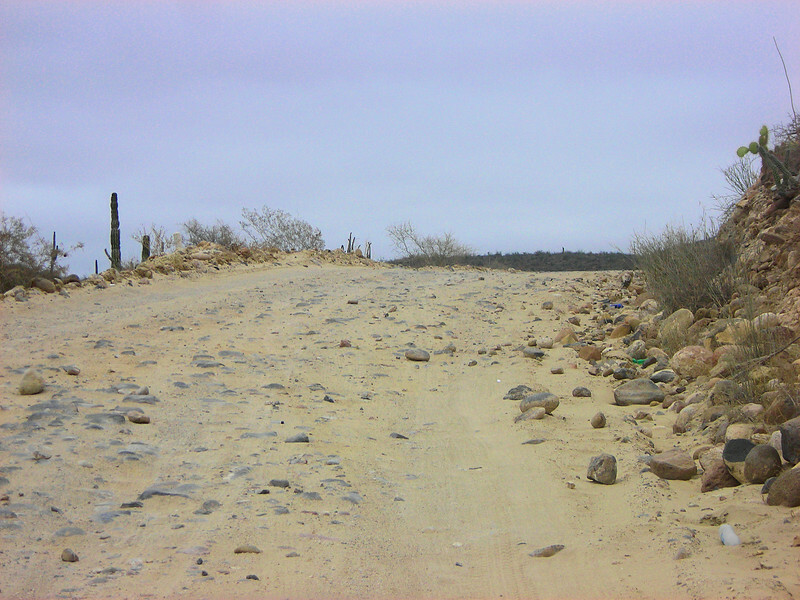 When we hit the paved road we turned left to La Purisima, the opposite direction we need to go. The map says this town has gas. 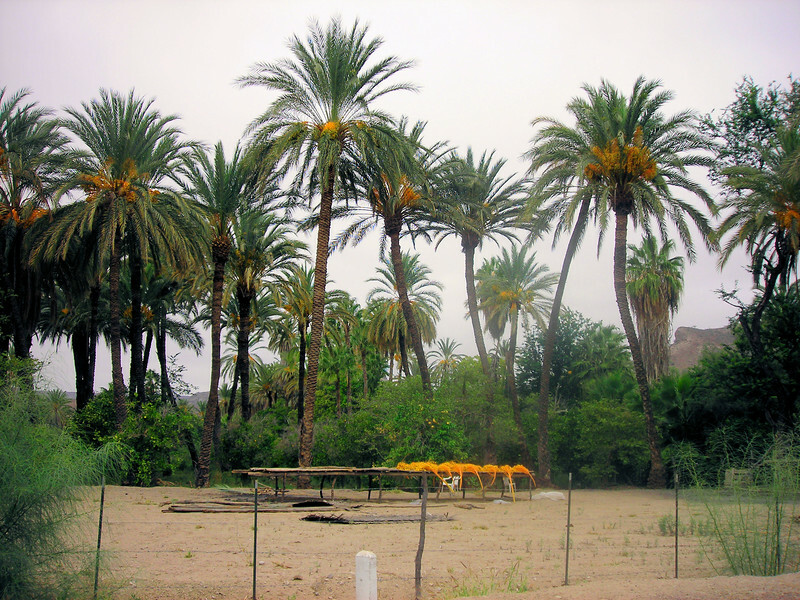 La Purisima is an oasis in the middle of a barren desert. Miles of fig palm trees. No one is around to sell us gas. I ask a woman walking down the street if there is any gas in town. She says no but described a place where we can buy gas. Then a police officer drives by in a truck and says there is no gas in town and described a place 7 or 8 kilometers out of town where we can buy gas. We don't have a good feeling about finding this gas place so we turn it around and make a run for Ciudad Insurgentes. I have confidence we will make it if I keep our speed down and hold the throttle steady. There is still water on the road but a lot less then when we came through here four days ago. No problem. We scan for a hotel on our way into town. Bike security and affordability is the priority. A few blocks from the malecon we find a hotel with a pool. The guy at the front desk says to pull the bike right into the lobby. The price is $57, not in our price range. 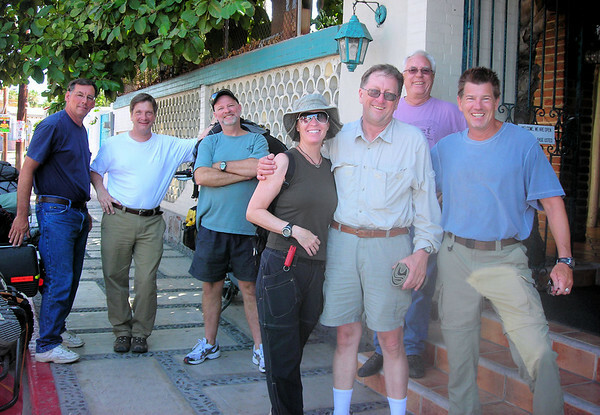 Next we find a place just off the malecon for $35 / night. The guy at the front desk there also says we could pull the bike right into the lobby. I say "If it will fit we will take it" We were too wide to fit and had to continue looking. Heidi spotted a hotel on our way into town that looked like it had a secure court yard. 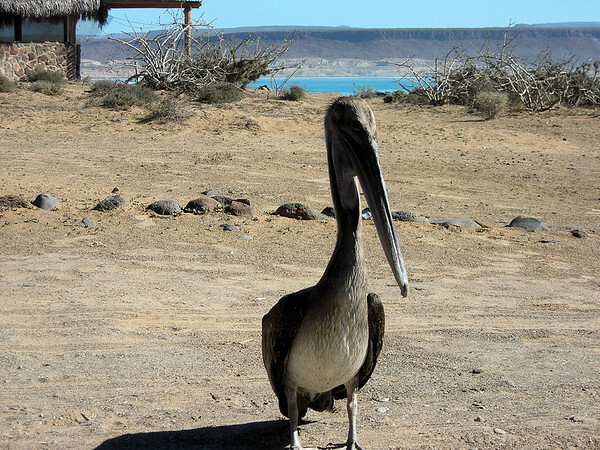 We head back a few miles and pull into Hotel Calafia. 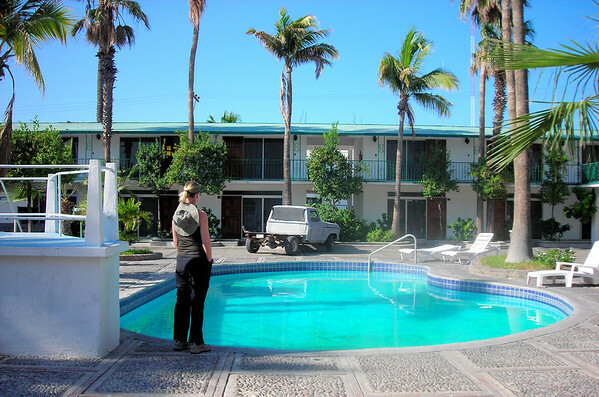 $33/night, king size bed, pool, restaurant and a very friendly feel. We are set. Cruising into town we spotted a DHL office so decide to send home our tent, bed rolls, one sleeping bag, my jeans and Heidi's long sleeve hooded sweatshirt, about 12 pounds of load. It's hard to describe the relief this brings. A lighter bike handles better, takes bumps and potholes better and is easier to push. 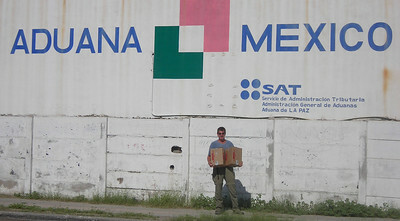 Before shipping the boxes out we have to get it cleared with Mexican customs. Luckily the customs office is just up the block. 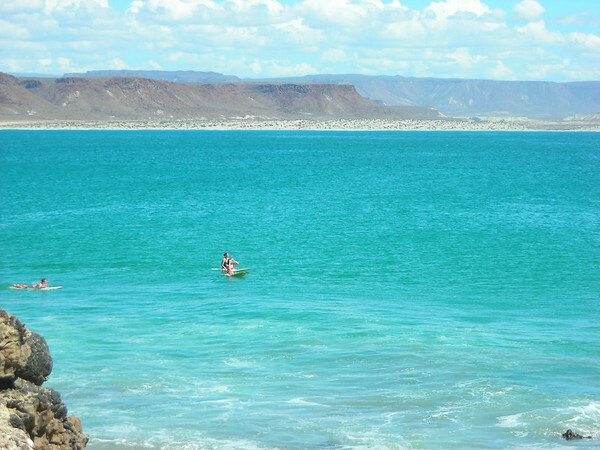 The malecon is only a few miles away from the hotel, a perfect hike in our book and the best to enjoying the sights and culture of La Paz, Mexico. Heidi spots a bunch of Adventure motorcycles and some guys standing around them. We go over to take a photo. I say "How are you guys doing?" "Where are you from?" I say "We are on our way to South America" they point to one guy, saying he rode down there. I ask if anyone is an ADVrider. I say "I'm cavebiker" One guy leaps forward with his hand out "I'm FlyingAvanti!" Unreal, this guy and his wife Sandy are like our heroes. 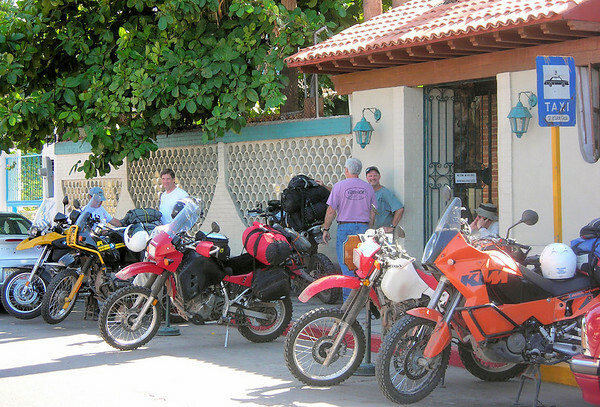 They cruised, 2-up through Central America and South America and posted one of the top Ride Reports on advRider.com. I have posted to his thread several times and we have e-mailed each other. FlyingAvanti is full of life telling us all sorts of information about our route through Central and South America. He is super sincere and offered to help us in any way through e-mails and phone calls. The whole gang is warm and friendly. We talk for a long time. 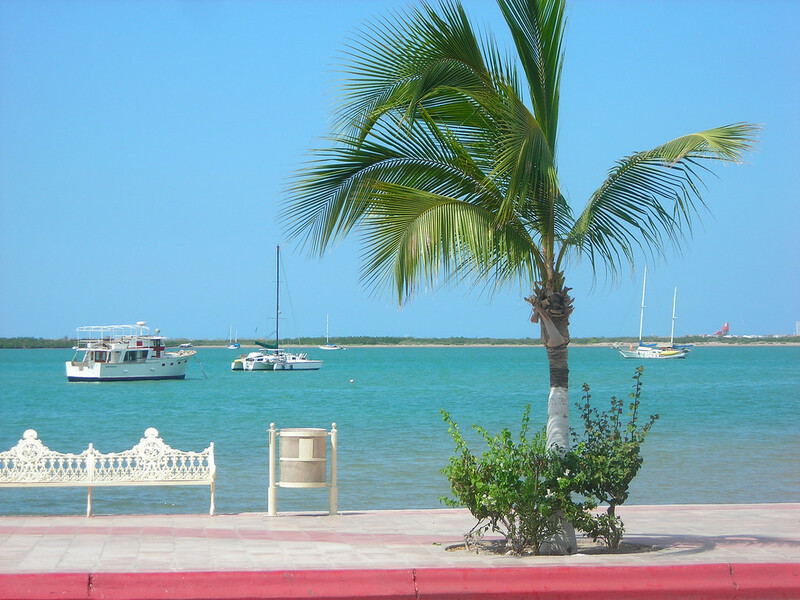 They are taking the ferry over to the mainland and heading to Copper Canyon next. We felt like we met a legend and let me tell you, he surpassed all our expectations. I asked if they are really advRiders.I guess so…. 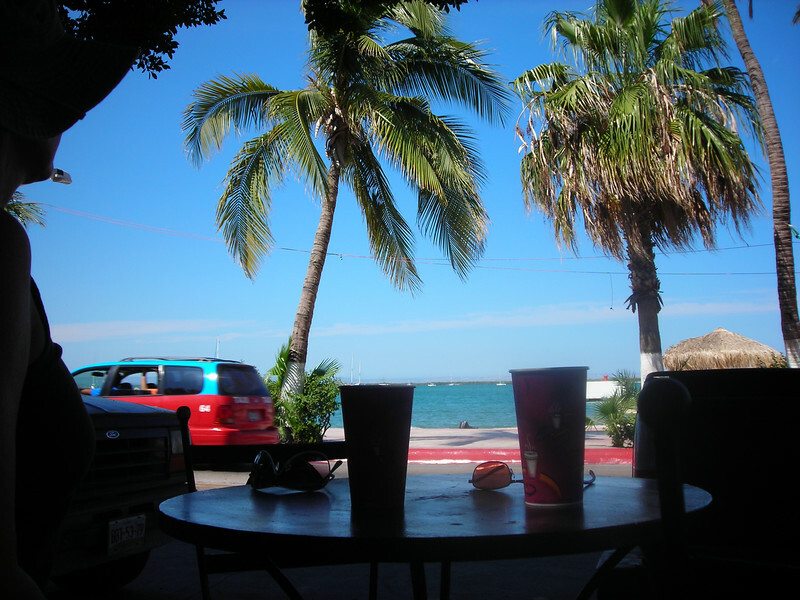 Cappuccino on the malecon, nice…..